Hayk Demoyan examines the status of Armenia-Diaspora relations and observes that the Armenian world is experiencing a deep crisis. His view is that the failure to develop these relations is due to a crisis in the elites themselves, both in Armenia and through the Diaspora. Obsolete models have been perpetuated, which cannot lead to any breakthrough within the Diaspora or in its relations with the Republic of Armenia. Hayk Demoyan sounds the alarm in front of the new threats and challenges ahead, that the Armenian world is facing with complete unpreparedness. I was following an interesting scene on board a plane flying from Yerevan to Paris while heading to Boston in the middle of August. A young mother of three was trying to convince her children to read Movses Khorenatsi’s History of Armenia, which remained half read. It was exactly the same edition of 1968 I had read when I was 14 years old. Despite her attempts, the youngsters sitting in front of me rejected the book, preferring their iphones and tablets. Maybe not all, but many know well that the fifth-century situation of the Armenians is described in somber tones at the end of Khorenatsi’s pious work, a section which was still awaiting the attention of the mother and her children on board of the plane. This section is the lamentation of Khorenatsi concerning Armenian reality shortly after the loss of statehood and the end of the Arshakuni dynasty. The founding father of Armenian historiography gave a condensed description of the situation of the Armenian state and Armenian people, which simply could be described as a definition of the national crisis. The remains of the Arshakuni kings, as archeologists claim, were found and displayed quite recently in the Armenian village of Aghtsq unceremoniously in the presence of the former Speaker of the Parliament and other politicians. Here the bones of the Arshakuni kings were buried in the fourth century after they were taken back from the Persian army, shortly after the latter’s invasion of Armenia. Too much symbolism? Maybe. But is it a new sign for a new loss of statehood we must face? The sad reality is that as a nation we are divided now rather than united, and there is much proof and evidence to back this unwanted statement. I am not intending to be a 21st century Armenian historian who will write another lamentation on 21st century Armenian realities, but at the same time I cannot keep silent on what we have both in Armenia and Diaspora, different from the non-existent realities artificially created by the President’s speechwriters and those who feel comfortable with the situation we have currently. The situation we have in Armenia and Diaspora relations could be labeled as a profound crisis on the elite level, which is an objective consequence of non-mature and dishonest relationships with no clear strategies and long-term action plans. There are many reasons to describe the existing situation as such, and there is no need to be an academician or to have skills in social sciences in order to understand the reasons and causes of that crisis. The failure to develop mutually beneficial and trustful relations within the past 25 years is a consequence of an elite-level crisis both in Armenia and Diaspora. The collapse of political life and corruption in Armenia, and an outdated structure with which many Diasporan communities still try to survive are not the only primary factors which caused the existing crisis. The “Armenian world,” propagated in Armenia at the highest levels not so long time ago, brought no substantive results to set a common agenda and strategic road map to follow, since it was more like an intellectual exercise, and not a clear strategy. One can agree on the formula, saying that Armenia is one thing with Diaspora and quite another without it. But the sad reality is that now we have Armenian statehood absolutely marginalized in regional and global politics, rejected even as a sole decision-maker in her external and internal politics. Armenia is pushed into a corner by her allies, or so-called allies, making her vulnerable many more times than before. Mutual ignorance and false rhetoric praising narrow interests and self-promotion accompanied most of the mutual relationships which led to further marginalization of the imagined icon of “Armenia strong with her Diaspora,” one we all were striving for in the first years of independence. Today we have enough evidence of distancing rather than bridging the motherland with Armenian communities worldwide. Armenia in its turn failed to turn into a dominant magnet and heartland for Diasporan communities. The latter also preferred to remain in their own worlds, being afraid of dependent and weak Armenian statehood instead of thinking and acting to strengthen REAL Armenia politically, economically and, of course, militarily. Instead an imagined homeland still prevails in most of Diasporan intellectual and political circles. The last 25 years were not enough to transform the mindset of Diasporan elite thinking from a symbolical and imagined homeland to the real one as an important and the ONLY prerequisite for developing further strategies of the Armenian world of global character. Unclear, suspicious and dispersed thinking banned the Diaspora from being the ONLY reliable ally of the Motherland, pushing it into an environment where it is isolated and ignored. Within the past 25 years, there were no any attempts to set up a qualitatively new structure which could enable the effective security of Armenia and Diasporan communities as one united strategic entity. Instead, age-old, completely outdated models were kept which cannot provide and secure any breakthrough both within Diasporan communities as well as in their relations with Armenia. Still surviving party-based structures, century-old enmities, divided churches, and the wasting of enormous resources for nothing and for no reason: this is the situation we are facing today. While speaking in the name of the Diaspora, most of the leaders in communities by default oppose themselves to Armenia, rather than trying to show their sympathies and support. Inclinations toward such dangerous opposition became evident during the Armenian-Turkish protocol period, which clearly exposed the absolute absence of dialog between Armenia and the various global communities, at least on the elite level. The reasons for such attitude are both subjective and objective. Armenia, now mired in rampant corruption and human rights violations, objectively gave birth to the formula “I am not going to give anything to Armenia.” At the same time that many preferred to hide themselves or feel comfortable with such mantras or expressions rather than to act, others preferred tourism and mentor-like attitude towards post-Soviet compatriots while residing in Armenia and trying to define new identities for themselves. The Ministry of Diaspora eight years ago failed to generate any strategic partnership plan or common agenda for Armenia-Diaspora relations. Instead, Soviet period Komsomol-type entertainments coupled with extensive medal awards and accomplishment ceremonies resulted in, or, it would be more correct to say, were aimed at further marginalization of Armenia-Diaspora relations. It is more than clear that one of the main responsibilities of the Diaspora ministry was to keep away any strong and effective involvement of Diasporan Armenians in both external and internal affairs of Armenia. Such effective presence was of vital importance at least to counter to the disastrous developments inside of Armenia and to have a positive impact on foreign policy preferences of the Motherland. Should we expect any breakthrough from the sixth meeting of Armenia-Diaspora scheduled for September 18-19? Definitely NO. Logically and objectively the past five forums showed that such gatherings are more like combined touristic package for many Diasporans wanting to enjoy the mild autumn season in Armenia rather than to speak about putting Armenia-Diaspora relations on the rails of short and long-term development strategies and strengthening the security of both Armenia herself and Armenian-Diaspora relations in general. 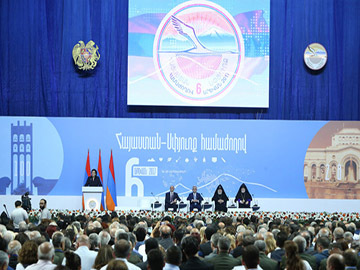 The Armenia-Diaspora congress scheduled for September 18-19 without a doubt will not bring any breakthrough in these strategically important but ignored and downplayed relations. As is expected, both sides will refrain from any intellectual, non-paper-based discussion and criticism of the existing sad and dangerous realities in Armenia and Diasporan communities. Such consensus is a long-orchestrated strategy between elites on both sides preferring banal and cheap patriotic rhetoric and slogans rather than open and sober discussion. The document put into circulation a year ago for setting up the Armenian council is outdated and does not reflect the existing realities of the crisis in Armenia-Diaspora relations and how to overcome it. It is sad to state that after suffering enormous human losses and suffering, millions of distorted destinies and emigration from Armenia, we are faced now with new dangers and challenges to overcome, though being absolutely unprepared to face them. We are in a deep crisis, ladies and gentlemen. This is a political, religious and intellectual elite-level crisis which could result in disastrous consequences in the nearest future if we fail to understand how to overcome this situation and enable new generation of decision makes to show up and set new agendas for strengthening the Armenian world. The new generation of decision makers are not those who are indoctrinated with political hatred to secure narrow minded interests or Soviet-type party boss clones to replace and duplicate old thinking guys. The original version of this article Armenia-Diaspora: Attempt No. 6 in a Period of Deep Crisis of the Armenian World appeared on the site "he Armenian Mirror-Spectator in September 14, 2017.